"Light, fresh chicken and wilted greens topped with tangy goat cheese." Bring the brown rice and water to a boil in a saucepan. Reduce heat to medium-low, cover, and simmer until the rice is tender and the liquid has been absorbed, 45 to 50 minutes. While rice is cooking, heat 1 tablespoon olive oil in a large skillet over medium heat. Sprinkle chicken breasts with salt and pan-fry in the hot oil until golden brown on both sides and no longer pink in the center, 5 to 8 minutes per side. Set chicken aside. Heat 2 tablespoons olive oil in the skillet; cook and stir garlic and pepper flakes in hot oil just until fragrant, about 1 minute; stir in spinach and cook, stirring often, until wilted, about 2 more minutes. Sprinkle with salt if desired. Spread cooked brown rice onto a serving platter and arrange chicken breasts over the rice. 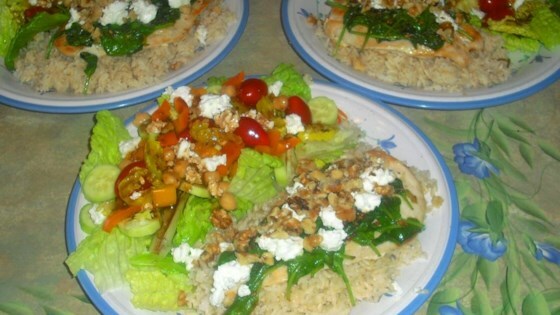 Spread spinach over chicken, sprinkle with pine nuts and goat cheese, and squeeze lemon juice over the dish to serve. Yum! I added mushrooms and an extra clove of garlic to the spinach mix. I put a bit extra goat cheese in, it was so light, flavorful and I will make it again! I did have to add salt. This was a hit with the whole family. Very simple, very tasty. Used walnuts instead of pine nuts since that was what I had on hand. Will be making this again! Everyone in my family enjoyed this.